Like- New Condition. Retails for $150. House of Marley Over-ear Headphones. Shipped with USPS Priority Mail. User Manual. Up to 12 Hours of Battery Life. Regrind Silicone Rubber. What's in the Box. House of Marley - TTR Over-the-Ear Headphones - Black/Red. Condition is Used. Shipped with USPS Priority Mail. This Box is Open but the Earbuds are New. House of Marley Rise BT. On-Ear Bluetooth Wireless Headphones. First in class and comfort, Smile Jamaica combines FSC Certified Wood and recyclable aluminum housings to create an iconic Marley in-ear headphone that is available in a bounty of colors. - Device Compatibility: All Marley BT devices undergo rigorous testing to ensure devices compatibility. 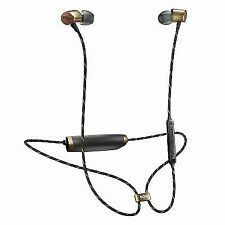 House of Marley EMFE053SB Voyage Bluetooth Earphones Mic Black. Format: HEADPHONES, Black,With Microphone,IN-EAR Headphones,Bluetooth. Bluetooth 4 with A2DP stereo audio. Sorry, international expedited service is not available. The optional cable with in-line microphone and a 1-button remote has you covered when you need to plug in. Press play and get ready for the wireless revolution. We are driven to enhance lives through great product experiences as well as using proceeds from product sales to support global reforestry through our foundation, Project Marley. House of Marley EM-JH121-SB Positive Vibration 2 Headphones Mic Black. Sorry, international expedited service is not available. Enjoy a truly impressive high performance sound quality. These are perfect to take with you when you travel. The wireless headset has a removable 1-button microphone on the cable for ease of use that allows you to play, pause, and skip music. 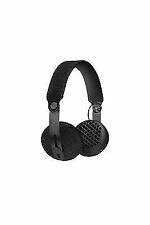 House of Marley EMJH101BK Rebel Bluetooth Headphones Mic Black. Format: HEADPHONES, Black,With Microphone,ON-EAR Headphones,Bluetooth. Bluetooth 4 with A2DP stereo audio. Sorry, international expedited service is not available. 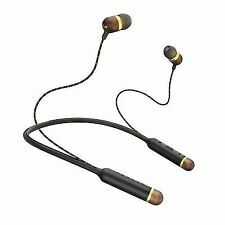 House of Marley EMJH111BK Rise Bluetooth Headphones Mic Black. Format: HEADPHONES, Black,With Microphone,ON-EAR Headphones,Bluetooth. Bluetooth 4 with A2DP stereo audio. Sorry, international expedited service is not available. 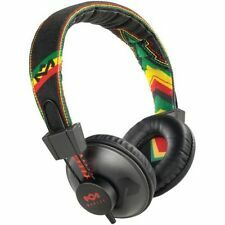 House of Marley Buffalo Soldier Bluetooth Wireless On-Ear Headphones, Black Condition is Used. Shipped with USPS Priority Mail Medium Flat Rate Box. House of Marley EM-JH121-DN Positive Vibration 2 Headphones Mic Denim. Optimal comfort. You should see the option when you check out. Stainless steel tactical design, FSC certified wood. Format: HEADPHONES. Bluetooth 4 with A2DP stereo audio. Micro USB cord for charging. You should see the option when you check out. Sorry, international expedited service is not available. 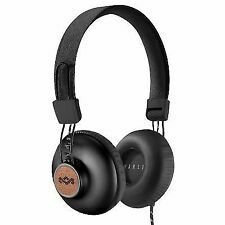 NEW House of Marley Buffalo Soldier Wireless On-Ear Headphones Signature Black New still in the box Only shipping in USA No return thank you! 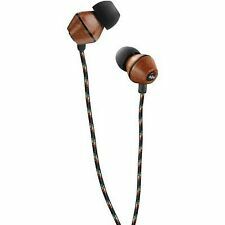 House of Marley Smile Jamaica Earbuds (Rasta). 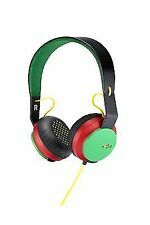 Up for sale is a House of Marley Liberate Wired Foldable Over-Ear Headphones. The headphones are in very good condition with wear from prior use.